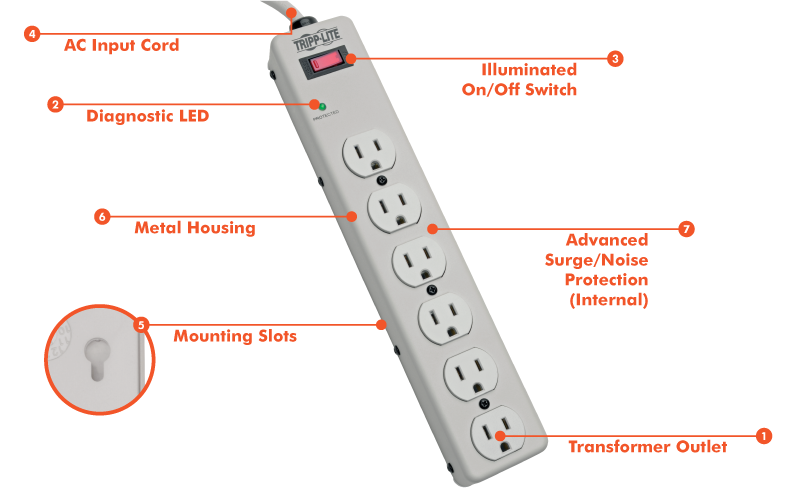 Tripp Lite's TLM606HJ surge suppressor offers complete AC surge suppression for comprehensive protection of personal computers, home stereos, televisions, VCRs, DVD players, power tools and other electrical and electronic equipment. Heavy-duty AC surge suppression shields connected equipment from damage and performance problems due to transient surges. TLM606HJ offers 6 total outlets, a 1.83 m (6-ft.) power cord and diagnostic LED to warn of suppressor damage. AC surge suppression rated at 1340 joules shields equipment from surges and line noise. Rugged metal housing offers convenient protection of desktop computer equipment and accessories. 1340-joule surge protection rating – More joules mean more protection!